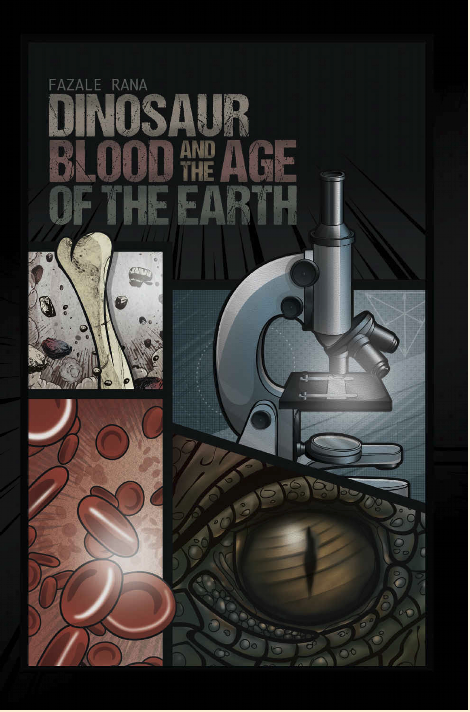 Dinosaur Blood and The Age of The Earth from RTB: MEDIA on Vimeo. Dr. Rana introduces the book by briefly explaining its purpose. Over the last decade, controversy has arisen surrounding studies that indicate long-term preservation of soft tissue in fossilized dinosaur bone. This is the source of controversy because it challenges the reigning paradigm of the understanding of how fossilization takes place. However, some Christians believe that it also challenges another paradigm: the age of the universe. The goal in this book is to explain just how compelling the evidence is for soft tissue being present in fossils dating millions of years yet demonstrate that the challenge is not to the scientifically established age of the earth but to the current understanding of the fossilization process. Chapter 1: Dinosaur Blood in Fossils: Who Would Believe It? Dr. Rana begins by taking the reader through the research of Mary Schweitzer. He details (from a lay perspective) the specimens, processes, doubts, and eventual conclusions of the various studies that she conducted. He explains her concern about presenting such controversial findings and the skepticism that she has experienced along with her responses to such criticism. He also bolsters the conclusion by mentioning several other studies that Schweitzer's work has inspired that has also yielded discoveries of soft tissue in other ancient fossils. While Rana presents a compelling case, he also recognizes skepticism in the scientific community and addresses attempts to find alternative explanations for Schweitzer's results. However, he finds that none of the explanations are consistent with the evidence or are so improbable to be indistinguishable from pure speculation. He concludes that a paradigm shift needs to take place, but not where many Christians demand. Many Christians have seized on the work of Mary Schweitzer as evidence that the earth is only about 6,000 to 10,000 years old. One such Christian is biologist Brian Thomas of the Institute for Creation Research. Dr. Rana believes that Thomas' work provides the most thoroughly researched and clearly articulated argument for soft tissue providing evidence of a young earth. Rana describes the argument presented by Thomas as having to necessary foundations: that dinosaur fossils contain authentic soft tissues and that the decay rates of biomolecules (what composes the soft tissues) is accurately understood to result too quickly to allow for preservation for millions of years. Having already established the first foundation in the first chapter, Dr. Rana provides the source and the conclusion of the research used for the second foundation required by Thomas' conclusion. Thomas concludes that only three possible interpretations exist: that soft tissue is authentic and that an unknown natural process is at work to prevent rapid degradation; that the soft tissue is authentic and the radiometric dating techniques used to date fossils at millions of years is wrong (the fossils and, consequently, the earth are young); or that the soft tissue is not authentic and dating is a non-issue. He believes, along with other young-earth creationists (YECs) that the first and third options are not supported scientifically, so by the process of elimination, they conclude that the radiometric dating methods are incorrect and that the fossils and earth are actually only a few thousand years old. Dr. Rana, on the other hand, believes that radiometric dating is accurate. He provides an explanation of various methods and how they have been tested (using historical records of events and tree rings) and calibrated. He notes that it is important to understand the limits of each method. Many of the YEC concerns with radiometric dating methods can be resolved simply by not trusting a particular method outside its usable dating range. With over forty different methods may be used to date objects across time, many of them overlap in their ranges. The overlap has provided the ability to test consistency among the various methods, which has been done numerous times. Because the evidence is heavily weighted towards the reliability of radiometric dating, Rana accepts its reliability. However, Brian Thomas and his team did find some carbon-14 results that seemed to be inconsistent with the reliability of such dating methods. Dr. Rana offers several explanations, consistent with the reliability of radiometric dating methods, that do account for the results reported, and he provides evidence that these are not merely wild speculations. He also explains that the values reported by Thomas are impossible to reconcile with his own model's predictions (even different predictions of altered forms of the model) by several orders of magnitude. Due to the facts that the evidence supports the reliability of radiometric dating techniques (when used properly), the various techniques produce consistent results, and such reliability is compatible with results of Thomas' own research which cannot be reconciled outside of the reliability of radiometric dating, Rana proposes that radiometric dating methods are, in fact, reliable. Chapter 4: How Did Soft Tissue Survive In Dinosaur Fossils? Because of the reliability of radiometric dating, Dr. Rana rejects Brian Thomas' (and YECs') conclusion in favor of a natural process that prevents rapid degradation of soft tissues- a reworking of current models of this process. So exactly how is it possible, or even plausible that soft tissue survived for upwards of 500 million years? The reliability of radiometric dating and other dating methods provides indirect evidence that the model needs to be changed, but what is the direct evidence? Dr. Rana begins by explaining the structure of seven soft tissue molecules and how they combine to form extremely stable structures. He describes nine, recently discovered, non-exclusive mechanisms that scientists have found that further help to maintain the structure of these tissues for extended periods of time. None of them can single-handedly explain the preservation for millions of years, but many of them can work simultaneously to make the task quite plausible. Despite the recent discoveries, Brian Thomas still dismisses these mechanisms by saying that all molecules are subject to thermodynamic entropy. Rana explains that in this move, Thomas is failing to make an important chemical distinction. Rana explains the difference between thermodynamically controlled and kinetically controlled chemical reactions. The reactions in question are kinetically controlled, which can hold off chemical reactions nearly indefinitely. The research will, of course, continue, and as it does more mechanisms will be discovered and the model for soft tissue preservation will become more complete. Conclusion: Should You Believe It or Not? Dr. Rana concludes his book by summarizing the situation. The discoveries of Mary Schweitzer seem to be valid, which on the surface would indicate a young age for the fossils. YECs believe that these discoveries demand a paradigm shift in the scientific community. Despite YECs' excitement on these finds, all sound dating methods demonstrate that the fossils are, indeed, millions of years old. This indicates that the scientific paradigm with respect to soft tissue preservation needs to be revisited and developed more completely (as opposed to the paradigm regarding the age of the earth). The latest research has provided evidence that the original paradigm, in fact, was incomplete and is still quite incomplete even today. As research continues the new paradigm will shed more light on Schweitzer's research while keeping consistency with the fact that the earth is not young but old. As with all of Dr. Rana's previous works that I've reviewed (listed below), I highly recommend this one for anyone interested in the interaction between science and the Christian faith. While this book focuses on a single piece of evidence for one particular interpretation of the Genesis account of creation, it is important that the apologist knows the information before they go asserting this as evidence for a young earth. Not only is the evidence very much against a young age, but it is very strong for the antiquity of the earth, which is not in any violation of the Bible and does nothing but provide powerful evidence for the truth of the Christian worldview. On the other hand, continued usage of evidence to support a false view of reality, then connecting that false view to Christianity will only hurt apologetic efforts to demonstrate a reason for the hope that we have and stiffle evangelical efforts to complete the Great Commission. It is so difficult for my mind to accept the idea that soft tissue could last for over 500,000,000 millions years. I'm not saying it can't, I'm just saying WOW, that's a long time. Thanks for the open minded review! Indeed, that is difficult to believe. Dr. Rana wrote the book against the backdrop of "Ripley's Believe It Or Not" odditoriums and some of the unbelievable artifacts in them. On a side note, I noticed that if you have Amazon Kindle Unlimited, you can get the book for free. Check it out! Yes, it is extremely difficult to believe; in fact, impossible. Just scanning your review of the book, it appears that Rana just skims the surface of what research is being done on the topic. It comes across more as spin at the attempt to deny the obvious just for the purpose of desperately safeguarding their particular model of creationism. Dr. Mark Armitage, who is currently doing research on soft tissue from the remains of nanotyrannus, is finding not only soft tissue, but intact bonecells. He is currently writing a review of Rana's book. You can see a video response he gave to an online paper by Rana here, https://www.youtube.com/watch?v=RalYQA5BY_g I'm sure you won't appreciate the snarky smack talk he lays out, but if RTB's position of explaining away the clear evidence on this want to be taken seriously, Rana is going to have to interact with Armitage's research. Fred, snark doesn't bother me; lies, misrepresentations, and strawmen do. Before Armitage even gets to talk about Rana's work, he misrepresents Reasons to Believe's positions by saying that they do not accept a literal Adam and Eve, a literal Garden of Eden or the Fall. He is wrong on all three of those. They accept and rigorously defend all three. Whether this is due to his ignorance, unwillingness to accept that they hold these, or intent to deceive to keep his viewers from even considering their position, I do not know. What I do know is that if this misrepresentation is reflective of his mode of operation, there is no reason anyone should take his claims seriously. The snarkiness and derisive names that chooses to use to refer to Reasons to Believe and Dr. Rana certainly do not help his presentation. Now, let me get to his claims. Obviously, he has not read the book I reviewed above. Dr. Rana describes several (not just one) discoveries of soft tissue, not just in dinosaur fossils but also in other fossils of other animals. He uses the triceratops horn specifically as hard evidence (which Armitage complains that Rana ignores). He does not find any valid reason to deny the claimed finds, and he even goes so far as to say that scientists will continue to discover more and more. This is completely compatible with the research and discoveries of Armitage that he is saying that Rana rejects. Now, it sounds like Armitage believes that the only way to explain the soft tissue is because of recent fossilization. However, as described by Rana in this book there have been discovered nine different mechanisms that allow for the preservation of soft tissues over millions of years, and he expects more mechanisms to be discovered as research into the fossilization process continues. Rana is not denying any of the finds that Armitage describes. What he denies is that they make sense exclusively from a young-earth view, and he has the research to support that hypothesis. If Armitage has provided a critique of the mechanisms described by Rana, I certainly would love to see them. If you happen to have something with less of the distracting rhetoric and un-Christlike polemics, though, it would be greatly appreciated. BTW, if you subscribe to Amazon Kindle, you can get this book for free. If that is available to you, I highly recommend that you read the book fully to see that the claims that Armitage has made regarding Dr. Rana's work are inaccurate and incomplete. I know Mark personally, so I'll ask him about your objections to how he paints RTB's beliefs. He is currently in the process of reading the book for a lengthy review for CMI's Journal of Creation. You should note that his video is reacting to a paper on RTB's website, and not Rana's book specifically. That review is forthcoming. What Rana doesn't tell you about those so-called mechanisms is that they all have been debunked by ICR researchers, as well as Armitage. For example, there was an experiment with blood that Schweitzer and her team performed in which that gamed the experiment to keep the blood from congealing under controlled processes. It was declared that after 3 years of sitting in a lab without any serious amount of decomposition, that iron could preserve the tissue. That is bogus and bad science. It doesn't com close to reproducing the genuine conditions. It is worth noting that when Mary Schweitzer first confirmed soft tissue in her famed T-rex specimen, that RTB took the side of the evolutionary haters and poo-pooed her findings as contaminated. They went the route of all the nay sayers and deniers. It wasn't until after she confirmed the same thing in a number of other dinosaur specimens, because she wanted to shut-up her ignorant critics, that RTB had to reluctantly acknowledge the evidence. Look, RTB has a worldview to defend. Ross has committed himself to believing that the findings of science is self-authenticating and is likened unto a 67th book of the Bible. Hence the so-called "revelations" of science are of equal authority as the revelation of Scripture. When such earth-shattering pieces of evidence come along that rock his worldview at its foundation, rather than reconsidering the integrity of the foundation, he attempts to recast the evidence, typically by piggy backing off of the secular folks who are also trying to protect the foundation of their anti-theistic worldview. That is not a place one wants to be when attempting to do Christian apologetics and who claims the have the reasons for believing. It leaves one in a precarious position of making a mockery of God. I'm about to begin a lengthy review of Ross's republished book, Navigating Genesis. I'll alert you when my first post comes up. I look forward to seeing Armitage's studies that show the lack of understanding of the nine proposed mechanisms, and I look forward to seeing his results repeated by the greater scientific community. His research certainly will spur on further research and ultimately result in greater understanding of fossilization processes and mechanisms. I do believe that we both believe that the Bible and creation come from the same Being (God). And I believe that we agree that God cannot lie and is omniscient. From those two true premises we can soundly conclude that nature and scripture do not contradict one another. As long as you understand that no man can infallibly interpret scripture, then you have reason to believe that we can use scripture to interpret nature and nature to interpret scripture. This also means that nature interprets nature and scripture interprets scripture. It is not enough to interpret scripture literally, it must be interpreted consistently. When our interpretation of one contradicts our interpretations of the other, we must reexamine our interpretation of one or both. If you believe that your view is the better interpretation of all the evidence from both scripture and nature, then you need to be able to consistently explain all that data including the reliability of radio metric dating and ice cores that have both been verified against written history. The weight of evidence is on the side of the universe and earth being old; the discovery of dinosaur soft tissue was unexpected, but I doubt that it is not irreconcilable, as you and Armitage claim. As Armitage continues his research I believe that it will lead to better understandings that will show consistency and more denial and more research by Armitage. I am excited for the process to continue. Regardless of where the research goes, we can rest assured that neither direction has any bearing on the truth of the life, death, and resurrection of Jesus Christ. The Christian worldview is not at stake here. Fred (and anyone reading), I encourage you to read through the comment thread between Armitage and me. In his most recent reply to me he not only did not attempt to answer even one of my questions, but he is now assuming that I am not a Christian and is exempting himself from the command given in Matt 28 based on the idea that the unbeliever (he's assuming that's me) does not accept the Ten Commandments. I would be extremely careful of using Armitage's videos in the future. Not only does he not wish to engage simple clarifying questions (not even challenging questions), but his liberal use of red herrings and ad hominem attacks does not set a good example of "providing a reason for the hope that we have...with gentleness and respect." He's refusing both parts of that scripture.